Create any tangible item, Card, tag, ATC, Layout, altered art piece, Banner, pretty much anything you can come up with that is tangible. and make sure you follow the theme and use some elements from one of my digital sheets. It doesn't have to be a sheet from my Valentine's Section, you can use any of my sheets as long as we can see that you are following the theme. You will want to check out the RULES page here. (I am sure the rules may evolve over time...but I will let you know). as a code at check out. Fabulous Creations from the Designers! Here are a few things I have made in the past using some of the sheets. You can see these on My Youtube too. 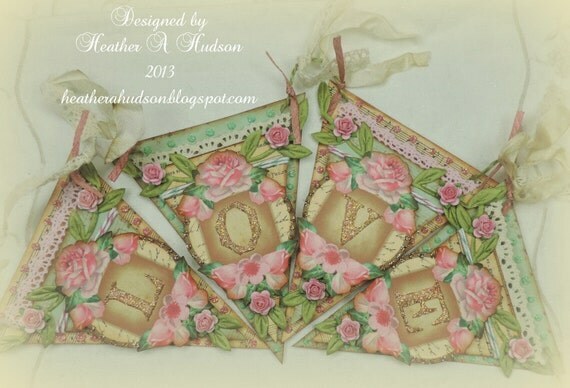 Love Banner using my Rose Focal and Banner Set. Created this fabby Tussie Mussie using my elements from the following collage sheets. Thank you so much Shea...this is beautiful!! 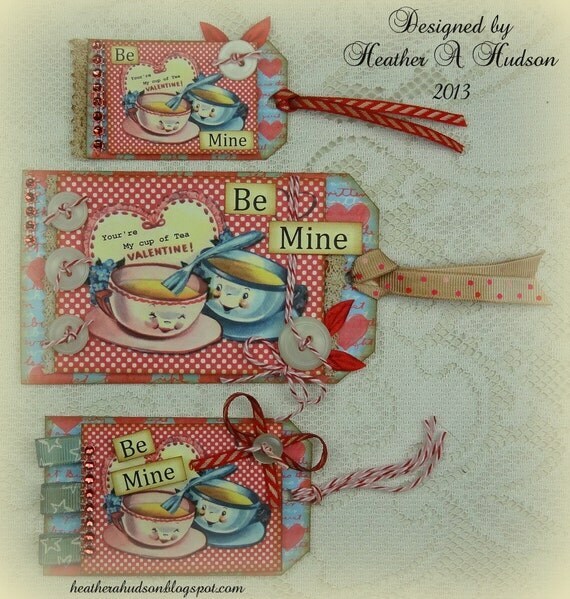 Created this darling tag using the Cherub, Hearts & sentiments & Traditional & fancy Pink Tag bases. A fabby Easel Card using the Traditional & fancy Pink Tag bases, Cherub, Hearts & sentiments, and Delivery Cherub sheet. Thank you so much Daniele...these are true beauties! Created this darling little Valentine Spoolie using my Hugs & Pooches set. Hugs and Pooches to you Sandi...I love it! 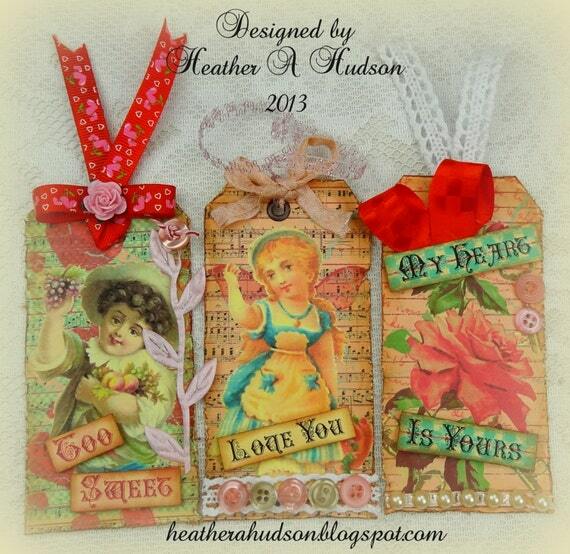 Created these darling tags using my Sweet little Girls and Boys Victorian tags set, and Romantic Tags and sentiments. Thank you so much Helene they are beautiful! Has come up with all kinds of beautiful inspiration for us!! I mentioned how I was a little behind on my own DT works (kind of common)...and she said I shouldn't worry..she would cover it for me...LOL...and she did! Thank you Carol for all of the lovelies!! 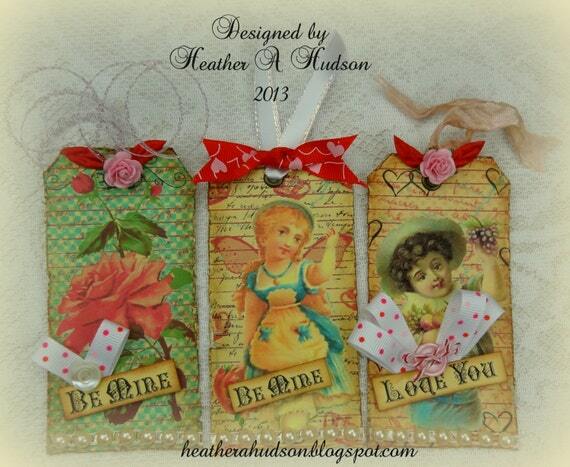 A beautiful tag using my Retro Red heart , Music background Tags, and Rose Banner Focals. Hugs and Pooches Card, using my Hugs & Pooches set. Beautiful Retro Red Tussie Mussie, using my Retro Red Heart shaped Tussie Mussie. Adorable Retro Red Pillow Box using the Retro Red Pillow Box sheet, Romantic Tags and sentiments, & Medium Conversation hearts. 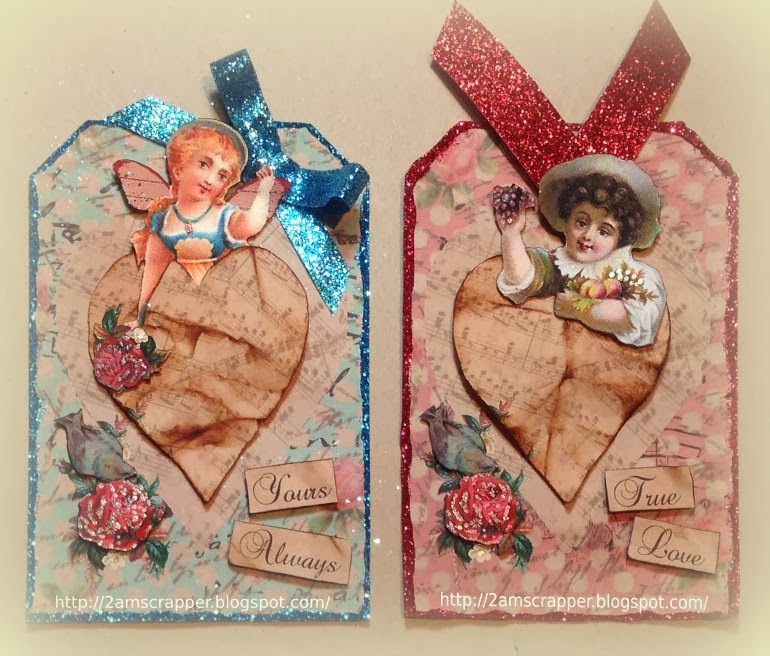 A lovely tag using my Romantic Tags and sentiments Set. 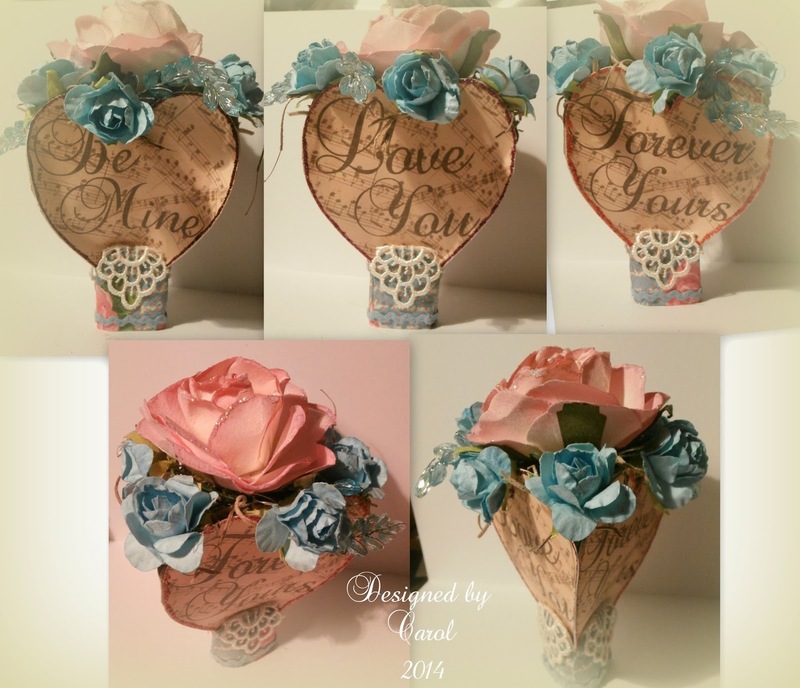 This adorable 3d cone using the hearts from Romantic Tags and sentiments! I sure hope I didn't miss anything Carol!! Heart Goes Pitter patter sheet. set. Thank you Anna!! It is adorable! Created this lovely tag using the Cherub, Hearts & sentiments, Tiny Conversation hearts, & Creamy White Fancy & Traditional tag bases. Thank you Starr this is adorable! I am looking forward to seeing everyone's creations!! 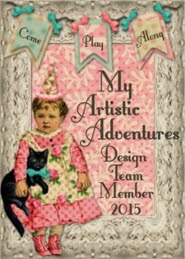 I have created a badge for my challenges, which I would soooo appreciate if you were to place it on your blogs. You can find the HTML code in the Gadget box in my Upper Left Column. This is what it looks like. you can see my tutorial on YouTube here. Interested in being a Guest Designer?? The DT and I will be picking our top three Favorite Projects (hopefully we get at least three entrees)..who will receive a "Top Three Badge" and a coupon code for 20% off their next purchase. 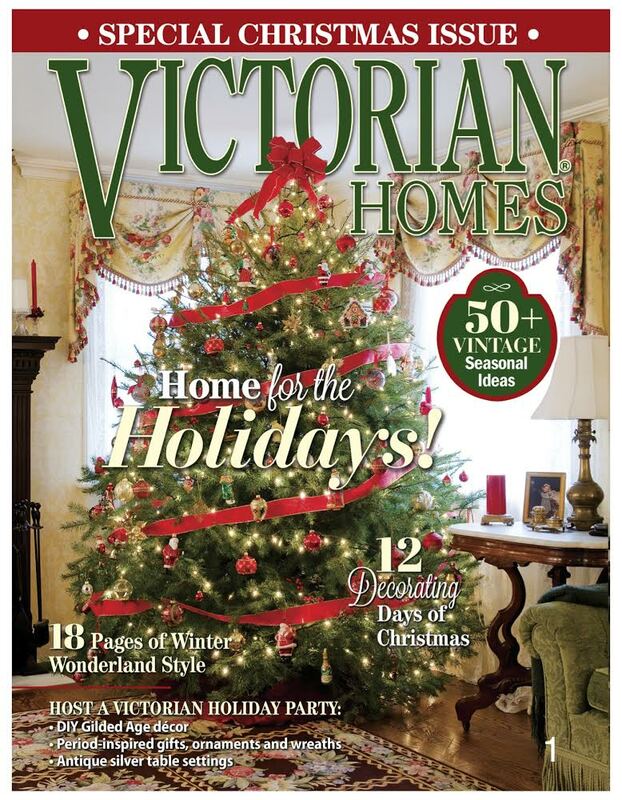 We will be choosing our Designer's Top Pick, which will receive a badge, be given the opportunity to Guest Design, and receive free images to design with. We will also have one Random Winner of a free digital collage sheet!! I plan on having a DT call in April. Gorgeous creations, all of them!! Oh my goodness, these are FABULOUS! Can't wait to visit all of the blogs and see them in minute detail! Congrats, Heather, on your new challenge blog - I'm sure you'll get lots and lots of participation! Hugs!! Congrat's on your new adventure Heather! I'm so glad I could be a part of it! Everyone on the DT did a wonderful job transforming your collage sheets into great works of art! Can't wait to see what other's will do! Fabulous Valentine's Day projects...love them all!! Congrats on your new Challenge Blog! Beautiful valentine projects - so fun to see all the creative and inspiring ways to translate the challenge! Happy 2014!